Hazrat Khwaja Banda Nawaz Gesu Daraz (name at birth: Syed Muhammad Hussaini) (Urdu:) (July 13, 1321 -November 1, 1422), was a famous Sufi saint from India of Chishti Order, who advocated understanding, tolerance and harmony among various religious groups. Gisu Daraz was a murid (disciple) of the noted Sufi saint of Delhi, Hazrat Nasiruddin Chiragh Dehlavi, who in turn was a disciple of Nizamuddin Auliya, the spiritual master of Delhi. After the death of his master, Chiragh Dehlavi, Gisu Daraz took on the mantle of the successor (khalifa). Thus later on when he moved to Daulatabad around 1398, owing to the attack of Timur on Delhi, he took the Chishti Order to South India. 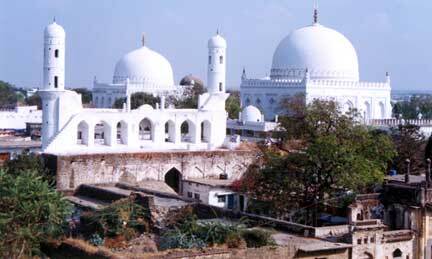 He finally settled down in Gulbarga, at the invitation of Bahamani King, ‘Taj ud-Din Firuz Shah’ (r. 1397-1422). He was born Syed Mohammed Hussaini in Delhi in 1321. At the age of four, his family shifted to Daulatabad in Deccan (Now in Maharashtra). In 1397, he went to Gulbarga, Deccan (Presently in Karnataka) at the invitation of Sultan Taj ud-Din Firuz Shah of the Bahmani Sultanate. Bande Nawaz authored about 195 books in Arabic, Persian and Urdu languages . At the age of fifteen, he returned to Delhi for his education and training by the famous Sufi saint Hazrat Nasiruddin Chiragh Dehlavi, who bestowed him with his Khilafath and succession after about fifteen years. He was also a very enthusiastic student of Hazrat Kethli, Hazrat Tajuddin Bahadur and Qazi Abdul Muqtadir. After teaching at various places such as Delhi, Mewath, Gwalior, Chander, Aircha, Chatra, Chanderi, Miandhar, Baroda and Khambayat, he returned to teach at his base, Gulbarga, in 1397 and died in Gulbarga in the year November 1422. His magnum opus, Tafseer Multaqat in Arabic, was compiled into one book very recently. It is unfortunate, however, that most people even within Gulbarga are unaware of this work. Little has been done to publish this and his other works on a large scale. Other books authored are: Avarif-ul-Ma`arif, Fasoos-al-Hukm, Qaseeda Amali, and Adaab-al-Mureedein. People from various walks of life, irrespective of caste and creed, assemble even today to celebrate the urs – death anniversary – (which takes place on the 15th day of Zul-Qa`dah of Muslim calendar at the famous Bande Nawaz Dargah in Gulbarga every year. His descendents still live in Gulbarga. Almost all family members along with several hundred thousand devotees from near and far irrespective of religion and beliefs gather to seek blessings. The present head of the family amongst his descendents is Syed Shah Khusro Hussaini, who has written many books about his great forefather.